The days are counting down and I'm starting to feel the painting competition crunch. 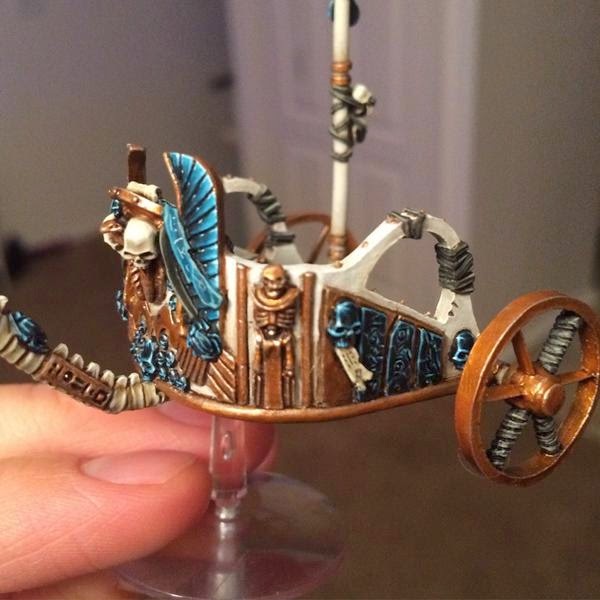 With only a few weeks left I have finished the chariot itself and it's on to the king and banner. At the end of part two I had the base and one construct done and the second construct underway. There's not much to report on the second guy since he was painted identically to the first. The hardest part of it was getting it to match as closely as I could to his brother. You would think that wouldn't be too hard, but when all of your highlights are mixes of colors it becomes a challenge maintaining the same saturation and brightness as what I did a few weeks ago. I have to say, it was very satisfying putting them together on the base. I feel like I may need to adjust the sand around their feet a bit after everything is done to make them more stable, but it shouldn't be a huge deal. With them out of the way it was on to the chariot itself. My armies colors are turquoise and white, but predominantly white. 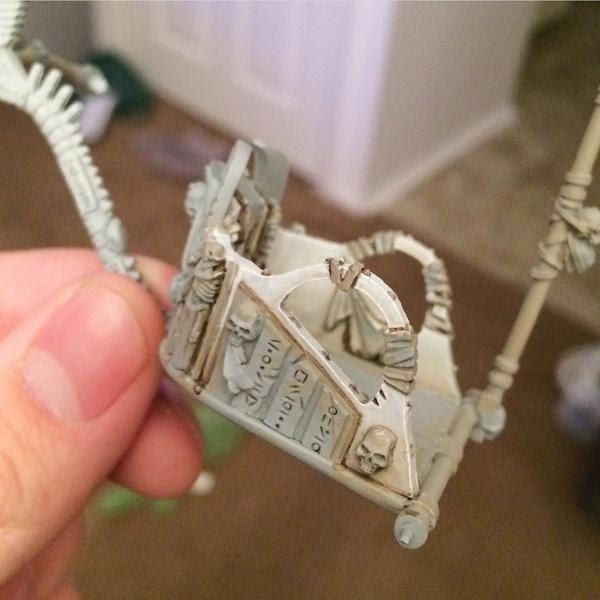 This meant that the body of the chariot itself was going to be mostly white. Let me tell you, that's not the easiest color to pull off. You don't want to shade it to much otherwise it starts to look like a grey, or beige in my case. At the same time though if you don't shade it enough then it just looks flat because you can't highlight something that is already white, that's the lightest you can go. It's a balancing act and I think I got it right. 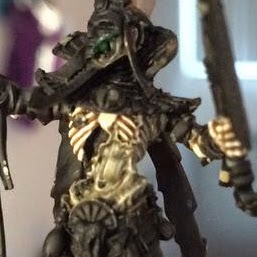 I used Rakarth Flesh as my shade with Agrax Earthshade for defining lines and the deepest shadows. The main color is actually a slightly off white with pure white only used for the final highlights. Next up was the gold and there was a lot of it. This was all painted the same way as the gold on the constructs. I made sure to break it up into chunks so I didn't get too bored. I believe I did the sides one at a time and then the yoke on it's own. After the gold was done on the main body I decided to get the entirety of the yoke done and out of the way. It wasn't a part of the model I was particularly looking forward to, so I figured it's best not to leave it till last. I was skeptical about the part that looks like bone, but in the end I really liked the effect. 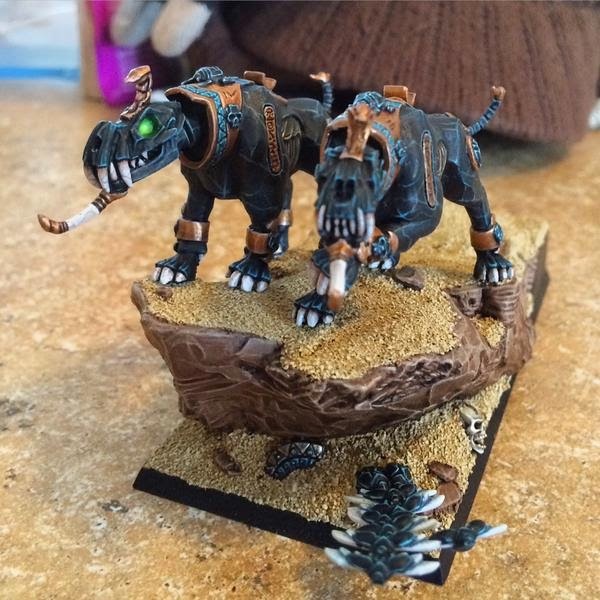 The skulls and scarabs were painted like gems in the same way as the constructs but provided a bit more of a challenge since there was more large rounded spaces on it and less hard edges. I broke up these areas by painting a starburst reflection. 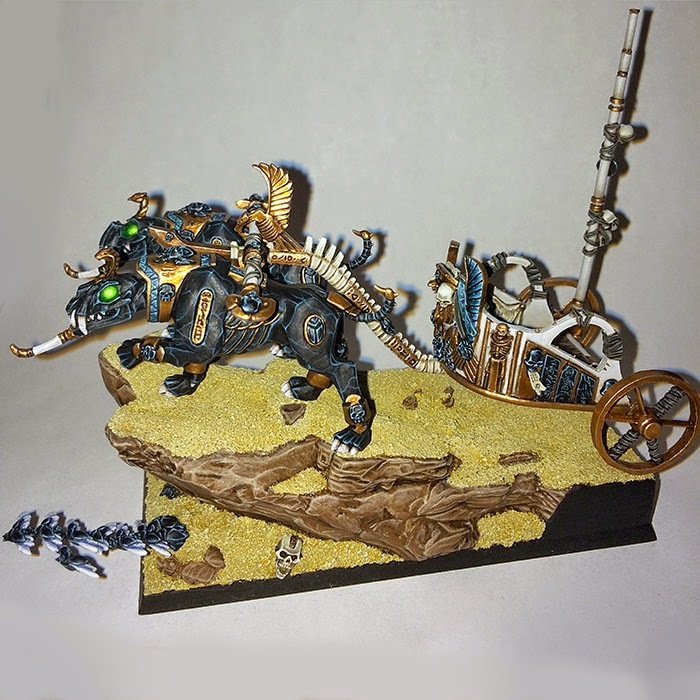 The heiroglyph slabs on the sides of the chariot were painted with the same marble technique as the constructs to help tie them in together. All of the skulls and scarabs were painted as gems with the feathers getting special attention. These were painted using the same basic colors and idea as the skulls but I spent a lot of time trying to carefully blend from black all the way to the light blue while being as smooth as possible. 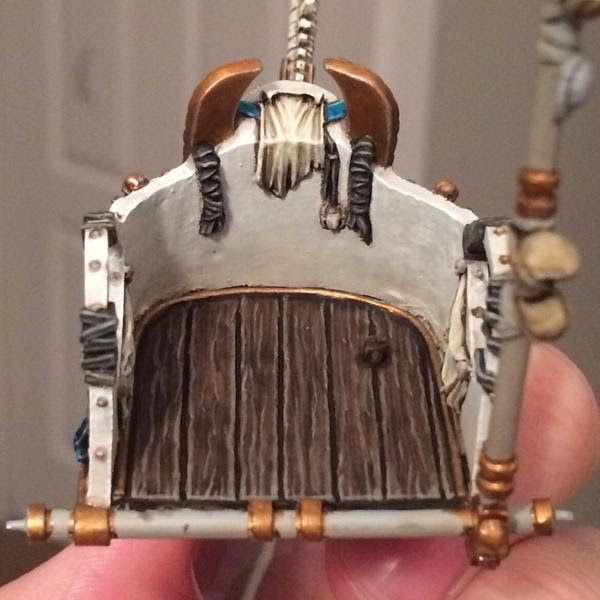 I painted the two skulls on the front as actual skulls to help tie the bone of the yoke into the chariot body. Plus I just thought it looked cool. I imagine they are the skulls of two of my king's worst enemies. 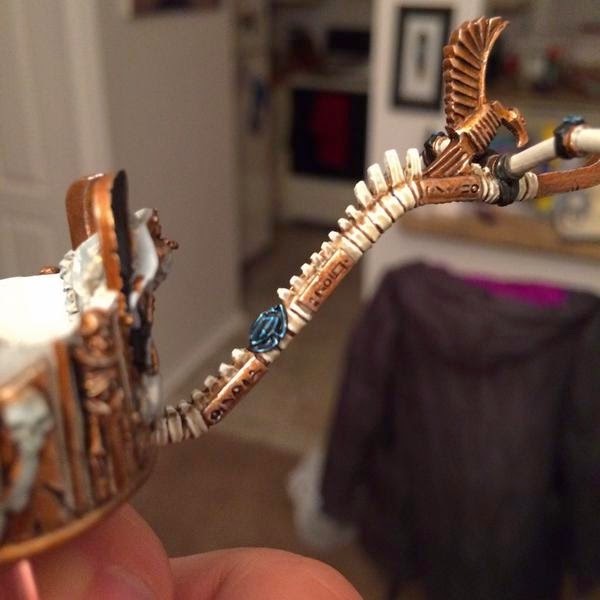 The "ribbons" coming off the pulpit were painted in my army's standard turquoise while the cloth connecting those two scarab gems were painted like the bandages. 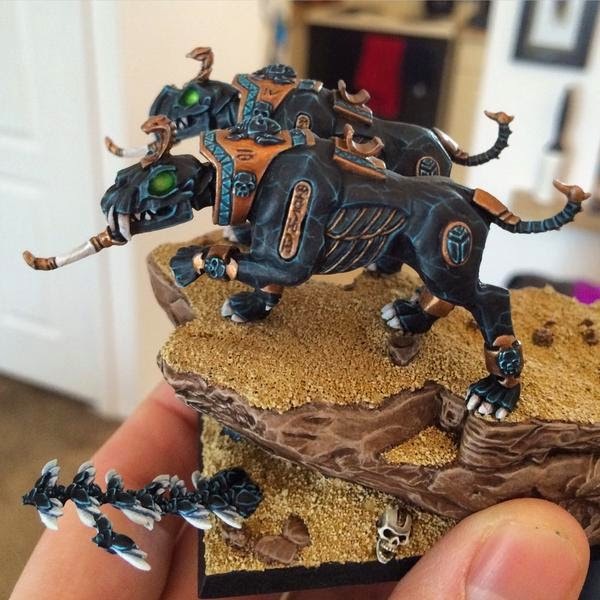 This is done with a base of Chardon Granite, shaded with Nuln Oil and then highlighted up by mixing in Screaming Skull. 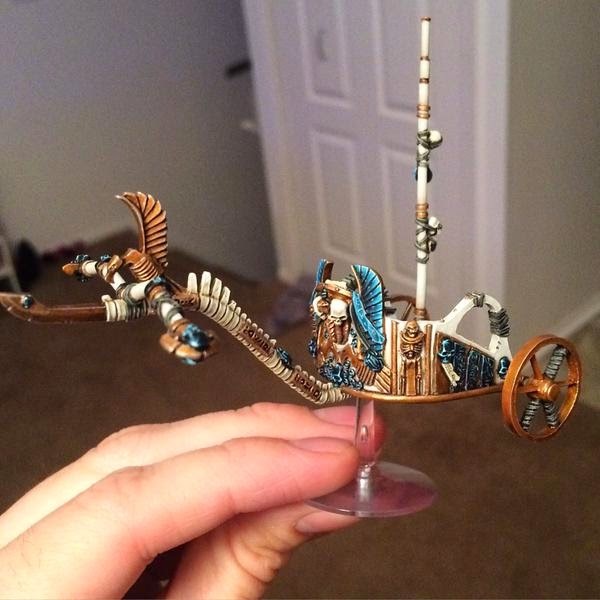 All of the papyrus scraps on the chariot were painted in the same way I did the bone. The floor was an interesting challenge for me since I was very tempted to not spend much time on it. In the end I kind of figured out it as I went along. It's Gorthor Brown with Rhinox Hide painted between the boards. 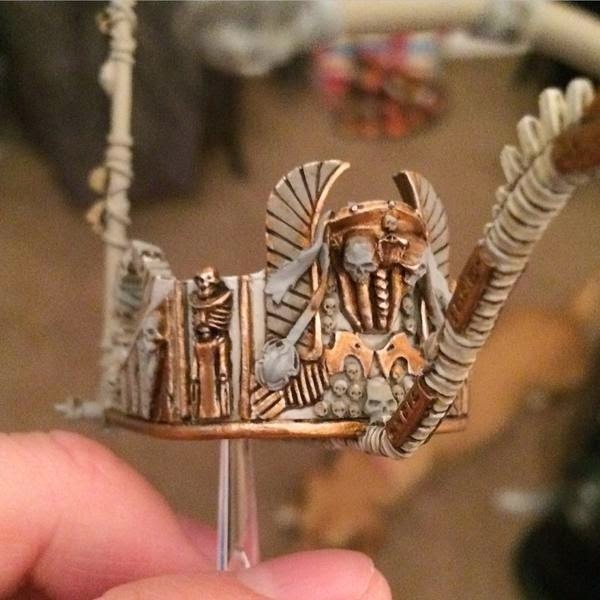 This was all given two washes of Agrax Earthshade then highlighted in a wood grain pattern with Gorthor and then Gorthor mixed with Screaming Skull. The last few areas left were the rear axel, the banner pole, and the wheels. The axel and banner pole were just more of the same, white, gold, bone, bandages and gems. I left them till the end because I held on to them a lot when painting and didn't want to rub the paint off on accident. The wheels were difficult because they are so plain. Originally I had them painted a bronze color like the blade on the front of the yoke. 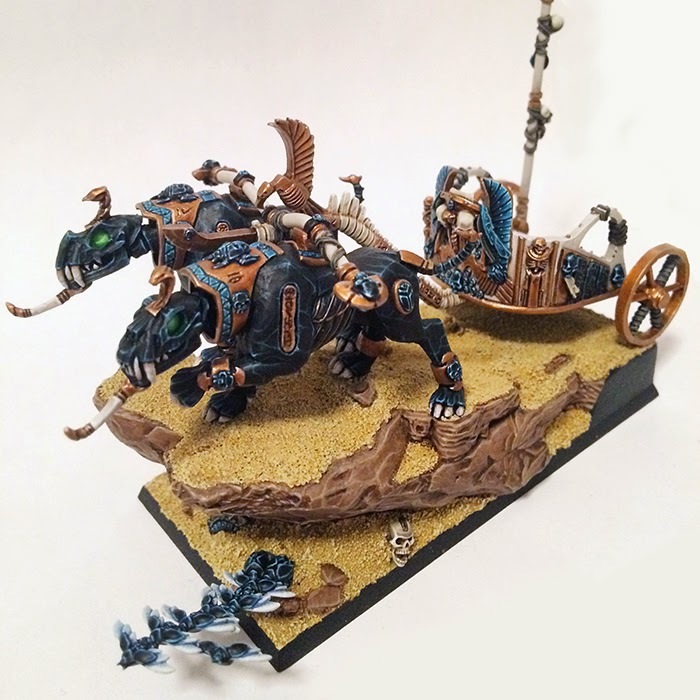 This is how I painted all of my other chariots but in this case it drew too much attention to the bland wheels since the color was different from the gold on the rest of it. I decided to repaint them as gold. While they are still plain they blend in better with the rest of the model. 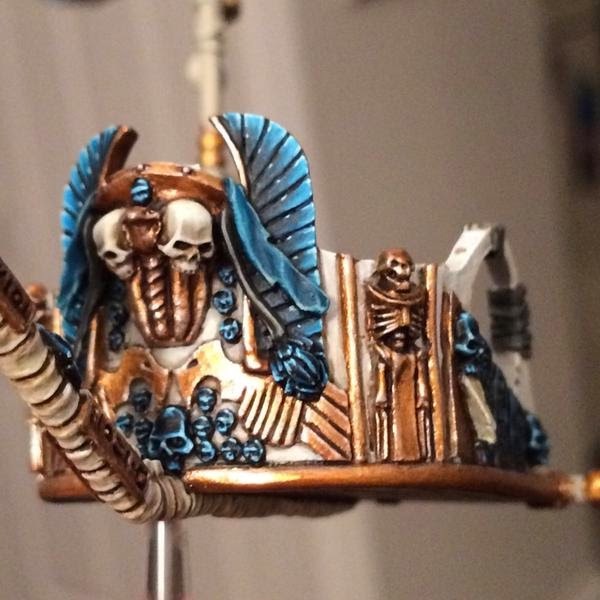 The gold also shows my shading and highlighting better then the bronze did for some reason. The final touch was to add hieroglyphs to the cloth and papyrus. 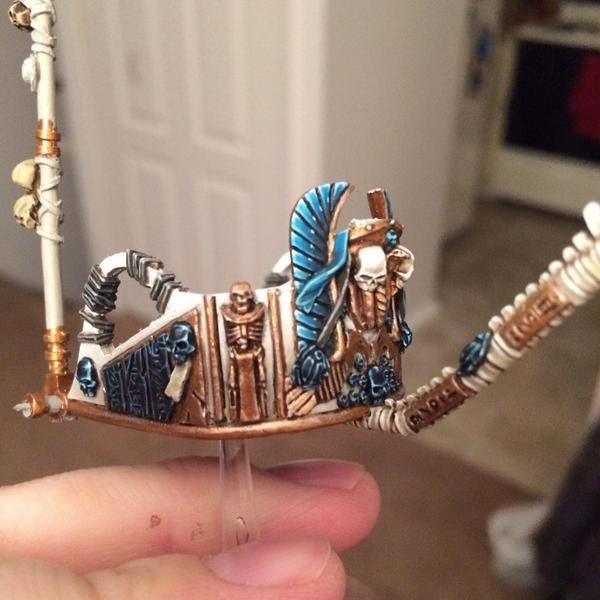 I just copied these from the 6th edition Tomb Kings army book. Now that it's done I can glue together all of these parts since everything else just sits on top of it. I still need to go through and paint gloss varnish on all of the gems, but I want to experiment with getting a little less shine out of my varnish before I do that. I am afraid of all of my painting getting lost in the shine. The above picture was taken with a flash to better show off all of the definition, unfortunately the color is a bit off. This one shows the color better but has less definition. So the reality sits somewhere in the middle. I will get much better pictures of it once it's all done and use my light box and my real camera.